I've never bought a group custom until now. I'm terrible about following indie FB groups. I'm in a handful including Portal to a Different Dimension, but I hardly ever remember to check it along with the other 20+ groups I'm in. I am horrific multi-tasker. I don't know how people follow and keep up to date with so many groups. It hurts my brain to think about it. I don't know what kind of luck I had to come across this polish in my feed, but I did. I've heard about other groups doing customs before, but never was able to catch them (the bad multi-tasking thing). I was able to spot this one though and I needed this polish! Mic Drop is a hot pink creme base with golden holographic glitter. Color: You know how I feel about golden holographic glitter? If a polish has golden holographic glitter I must have it. Mic Drop is insanely awesome. 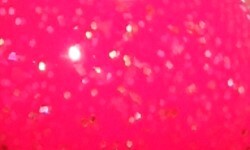 I love this hot hot pink with that gold glitter. It's bright, summery, and and definitely my type of color. Formula: Excellent formula. I used 2 coats above. This applied smoothly and easily. Price: Sadly, this is no longer available as it was a group custom that had a 72 hour purchase window. That being said, I do believe group customs will be continually for Different Dimension so be sure to join Portal to a Different Dimension so you can get in on the action.. Overall: I adore Mic Drop. This is vibrant and peppy shade that I adore. You know I love that golden holographic glitter, and that's what makes this polish for me. This polish is a stunner!